I must be honest. This post is being written because of my burden for what is going on today. Many Christians are neglecting church. Church attendance is on the decline. I recently went to North Carolina and most of the professing Christians that I talked to did not attend church. I understand that I was in the Bible Belt and everybody is a professing Christian. However, this happens everywhere. Everywhere you go there are professing believers who do not regularly attend church even though they can. Jesus died for the church. Throughout the New Testament the church is referred to as the body of Christ. Is it referring to a physical building? No, but it is referring to everyone who has truly been saved by the blood of Christ. Being a member of the body of Christ is beautiful because we have been joined to Christ in salvation and we receive all of the spiritual benefits. As the body of Christ, we demonstrate His heart and mind. Although imperfectly, the life of Christ will be reflected by the church. This means that the church will be loving, obedient, meek, devoted, holy, merciful, etc. 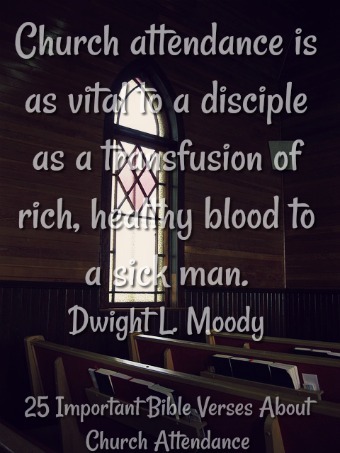 If the church should reflect Christ, then that means that the church should be devoted. Christ was always devoted to doing the will of His Father. It is God’s will that we regularly attend church. We are told to go to church for a plethora of reasons. Are you saved by going to church? No, of course not. Also, there are a number of reasons why someone might not be able to attend church such as an injury, work schedule, etc. However, we must always examine our deep motives. Are you not going due to excuses, laziness, or a lack of a desire to have fellowship with other believers? I’m not saying that you will have a perfect Sunday church attendance record. If we’re honest we’ve all missed church for one week, two weeks, etc. However, when we deliberately refrain from going to church that is sin! Not only is it sin, but we are not allowing God to involve us in His activity within the church. I’m not trying to be legalistic. We are saved by grace through faith in Christ alone. However, if someone is refusing to go to church and doesn’t have that desire to have fellowship with other believers, then that might be evidence of a person who is not truly saved. We should be committed to and involved in our local church. 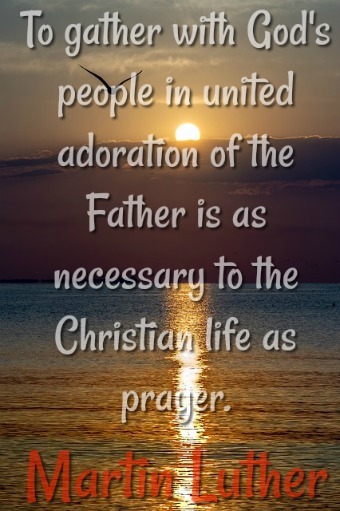 We can’t live this Christian life alone. In your time of need how can others help you and in someone else’s time of need how can you help them? God has used me to encourage others and be encouraged by others in the church. Do not doubt what God can do through you and how God can bless you through others. There are many things that we are told to do, but we can’t do them if we are not going to church. God has blessed us all with different gifts that are to be used for the edification of the church. Ask yourself, when is the church functioning best? It functions best when members of the church are actively using their gifts. Believers should desire corporate worship and being taught the Bible. Corporate worship and being fed the Word of God is essential on our walk of faith. Both are an important part of our maturity and growth in Christ. It doesn’t matter if you have been waking with the Lord for 30 years, you can never get enough of God’s Word. Also, you can never get enough of worshipping Him in a corporate setting. As I said before, Jesus died for the church. Why would we neglect what He died for? Worshipping the Lord and learning with my brothers and sisters is beautiful to me and it’s a precious sight in the eyes of God. 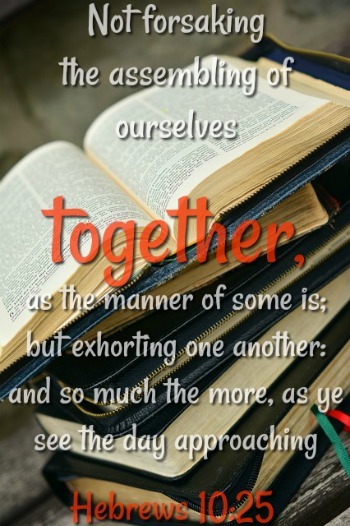 When believers gather together to worship the Lord in spirit and in truth the Lord is honored. Just as we should judge our motives for not going to church, we should judge our motives for going to church. Many believers go to church not out of love, but out of duty. I’ve done this before. If this is you confess your sins before the Lord. Ask Him for a heart that desires to love Christ and His church. Ask Him for a heart that desires corporate worship. Ask Him to remind you of why you go to church. Communion is regularly served in church settings. If you have been saved by Christ, you are now part of His family. We are told to love our brothers and sisters. How can you say that you love your family, but you don’t desire to have fellowship with them? It’s like someone who gets married, but refuses to live with their spouse even though nothing is hindering them. You will still be married, but you are making it harder for your marriage to grow and progress. In the same way you’re saved by Christ alone. However, you’re making it harder for yourself to grow and progress if you don’t go to church regularly. Also, you are revealing a heart that is selfish and lacks love for other believers. Please find a biblical church today!